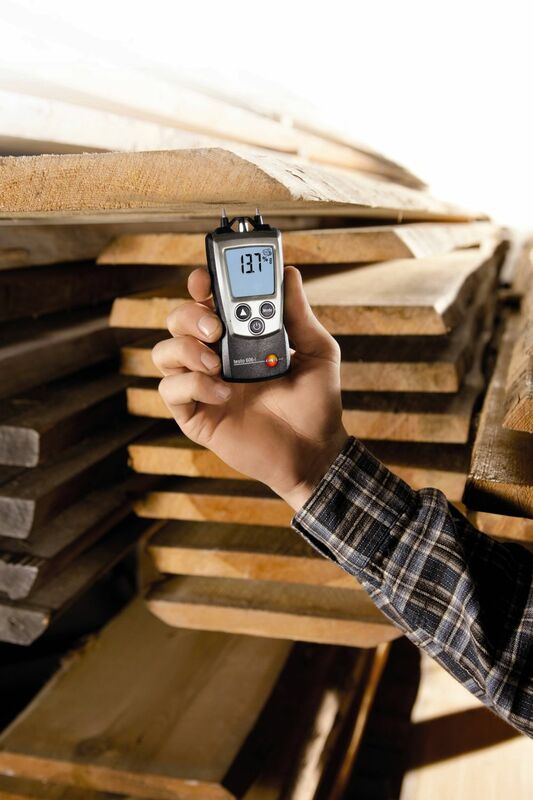 The testo 606-2 measures the moisture content of a variety of different types of wood and building materials. 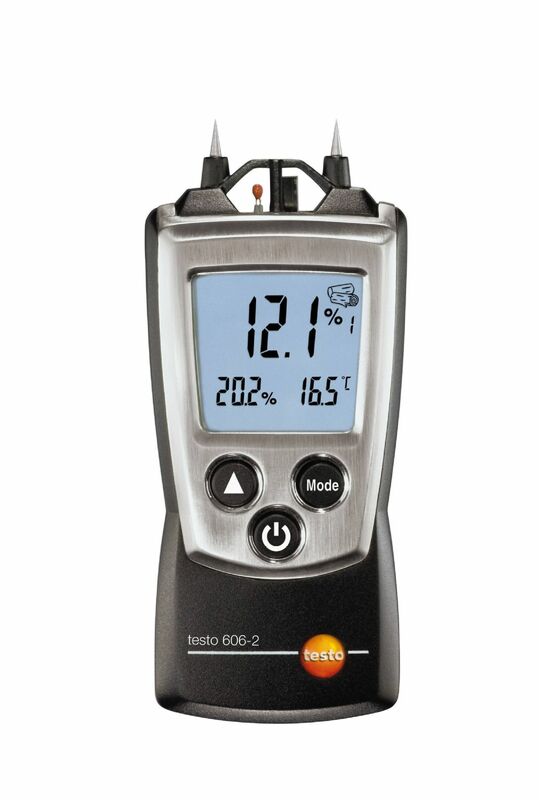 Apart from being able to measure moisture in the same way as the testo 606-1 moisture meter, the testo 606-2 is also able to measure relative humidity and air temperature and calculate the dew point and wet bulb temperature. This means that you are now not only able to measure the moisture content of the wood you have stored but also the relative humidity in the surrounding storage area. Armed with such valuable information, you can now easily determine whether the storage conditions are ideal or whether they need to be adjusted. The compact testo 606-2 moisture meter is designed to make work more efficient and life a lot easier. A variety of practical functions and features including a hold function which freezes the last reading; a backlit display for use in all lighting conditions; a slip-on protective cap and a belt bag which ensure that your moisture meter is stored safely and a hand strap that helps prevent your meter from being accidentally dropped all ensure that you are best equipped to carry out professional and reliable measurements. 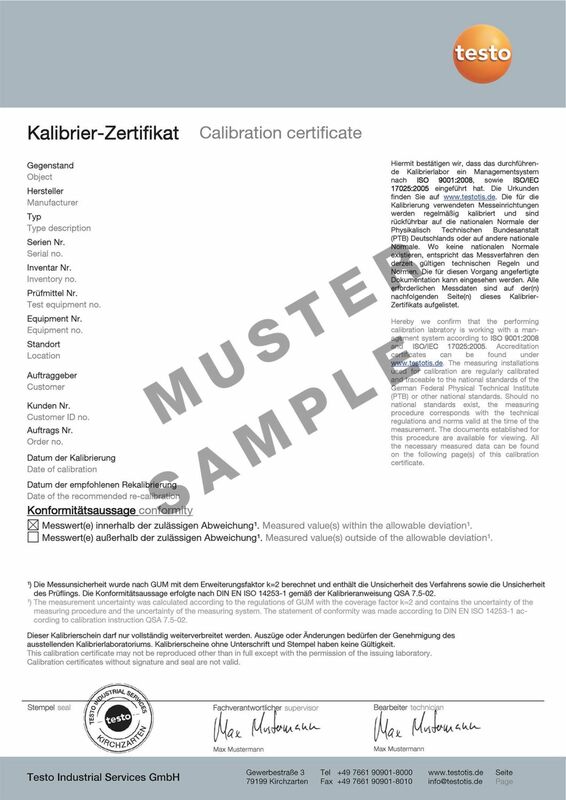 testo 606-2 moisture meter, protective cap, belt bag, calibration certificate, batteries. Moisture content is a decisive factor in the further processing and use of stored timber products. If wood is installed with the wrong moisture content this may result in mechanical deformations (contracting and swelling) at the site where the material is subsequently used, and therefore damage to pieces of furniture or entire supporting structures in buildings. Therefore, before being made into furniture or supporting material by a joiner/carpenter, the suitability of the wood has to be assessed by measuring the moisture content. The testo 606-2 is a particularly practical and easy to use material moisture measuring instrument in pocket size. The material moisture is displayed directly in percentage weight by means of stored material characteristic curves for wood and building materials. Characteristic curves are available for measuring wood moisture in beech, fir, larch, oak, pine and maple wood. The building moisture measuring instrument uses two electrodes rammed into the wood for its reading. In addition to material moisture, the testo 606-2 also measures humidity and air temperature. In this way, drying conditions, for example, can be assessed on site quickly and reliably.